This flying model rocket doesn't go quite as high. Good thing too, it would make recovery impossible. 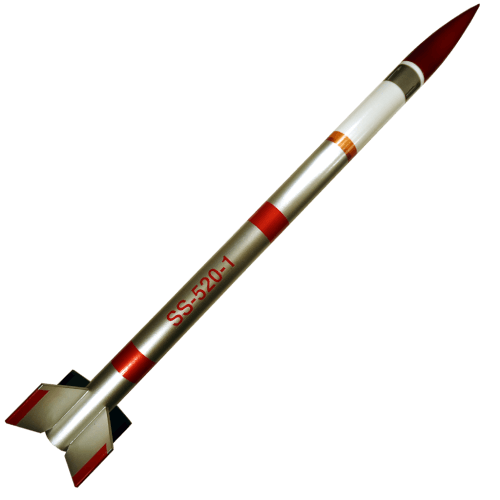 The SS-520 rocket does, however, fly on a cluster of two 18mm motors for added fun and excitement. The self-adhesive decal sheet includes fin wraps, lettering, and body wraps. This kit includes the ejection baffle, which makes it much easier to get this rocket ready for launch. While the four small antennae and balsa fins are pre-cut, handling the small antennae offers a challenge. This makes the SS520 kit close to a skill level 3 kit, but not quite. Parts include pre-cut 1/8" balsa fins, two body tubes, sturdy coupler with baffle, laser-cut plywood centering rings, and other parts needed to build this model rocket. Supplies such as glue, sandpaper, and paint are not included.